It was recently announced that Encyclopaedia Britannica would stop publishing print editions of their 32-volume sets. 2010 will be their final edition, so to the few of you who shelled out thousands of dollars for those babies, may I suggest holding onto them for dear life, because they're about to become a rare species. This is just another nail in the coffin of print media, and I can't help worrying that, in the not too distant future, there will be no such thing as bookshelves in modern homes across the world. Excuse these trivial concerns from an old fogey like myself, someone born at the end of the 20th century). 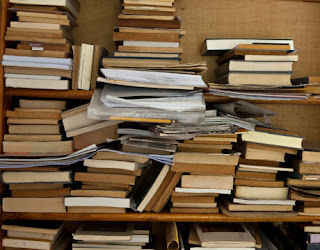 I consider myself a traditionalist when it comes to reading and collecting old-fashioned books, flipping through tangible pages and taking a whiff of freshly published (or old and musty) paper. That's how this bibliophile rolls, despite the fact that I own a Kindle (given to me as a birthday gift last year...I've only read one book on it thus far). Like other media-filing racks and organizers, the bookshelf may soon be an antiquated piece of home furnishing. A friend of mine once said that it's his dream to own a minimalist home with not a single book, CD, or DVD in sight. Everything would be digitally stored in one little box or on a mobile device. No muss, no fuss. And with the way our tech culture is rapidly evolving, it isn't hard to imagine some homes already adopting this motif. And it isn't just happening in homes. I once did a temp job at an accounting firm that decided to go completely paperless. My task was to scan every single file in their records and save them to a hard drive. File cabinets were emptied, bookshelves cleared. Soon enough, after all of that useless paper had been shredded and recycled, there was a lot more space. What would one do with all of that emptiness? Practice some yoga? Roll a treadmill into the office? We're humans; we always find ways to fill up space and use up more resources. To me, a nicely packed bookcase, filled to the brim with various-sized paperbacks and hardcovers, is a cozy sight. It's a physical reminder that many worlds and characters await at my fingertips, at the turn of a page (as opposed to a sleek tablet with touchscreen buttons). 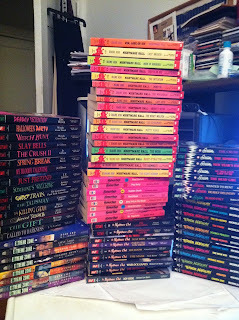 Additionally, most of the young-adult novels I've amassed throughout the 90s (as seen above, left) are out of print now. They're rare gems (in my mind). They deserve a home, nestled in the confines of a sturdy shelf. Or maybe I'm just a hoarder. Just like DVRs killing the relevance of watercoolers as a place to discuss favorite TV shows, I'm afraid that e-readers and tablets will cause bookcases to be put on the extinction list.